In mathematics, an arithmetic progression (AP) or arithmetic sequence is a sequence of numbers such that the difference between the consecutive terms is constant. For instance, the sequence 5, 7, 9, 11, 13, 15 � is an arithmetic progression with common difference of 2. 1. Positive, the members (terms) will grow towards positive infinity. 2. Negative, the members (terms) will grow towards negative infinity. In which of the following situations, does the list of numbers involved make as arithmetic progression and why? (ii) The amount of air present in a cylinder when a vacuum pump removes of the air remaining in the cylinder at a time. (iv)The amount of money in the account every year, when Rs 10000 is deposited at compound interest at 8% per annum. (ii) Let the initial volume of air in a cylinder be V lit. In each stroke, the vacuum pump removes of air remaining in the cylinder at a time. In other words, after every stroke, only part of air will remain. (iv) We know that if Rs P is deposited at r% compound interest per annum for n years, our money will be after n years. First four terms of this A.P. will be - 2, - 2, - 2 and - 2. First four terms of this A.P. will be 4, 1, - 2 and - 5. First four terms of this A.P. will be . Clearly, the series will be 1.25, - 1.50, - 1.75, - 2.00 ……..
First four terms of this A.P. will be - 1.25, - 1.50, - 1.75 and - 2.00. For the following A.P.s, write the first term and the common difference. Which of the following are APs? If they form an A.P. find the common difference d and write three more terms. Fill in the blanks in the following table, given that a is the first term, d the common difference and an the nth term of the A.P. A. 28 B. 22 C. - 38 D.
Which term of the A.P. 3, 8, 13, 18, … is 78? Find the number of terms in each of the following A.P. If the 3rd and the 9th terms of an A.P. are 4 and - 8 respectively. Which term of this A.P. is zero. If 17th term of an A.P. exceeds its 10th term by 7. Find the common difference. Which term of the A.P. 3, 15, 27, 39, … will be 132 more than its 54th term? Two APs have the same common difference. The difference between their 100th term is 100, what is the difference between their 1000th terms? How many multiples of 4 lie between 10 and 250? Determine the A.P. whose third term is 16 and the 7th term exceeds the 5th term by 12. The sum of 4th and 8th terms of an A.P. is 24 and the sum of the 6th and 10th terms is 44. Find the first three terms of the A.P. Ramkali saved Rs 5 in the first week of a year and then increased her weekly saving by Rs 1.75. If in the nth week, her week, her weekly savings become Rs 20.75, find n.
Find the sum of the following APs. (viii) Given an = 4, d = 2, Sn = - 14, find n and a. (x)Given l = 28, S = 144 and there are total 9 terms. Find a. How many terms of the AP. 9, 17, 25 … must be taken to give a sum of 636? The first term of an AP is 5, the last term is 45 and the sum is 400. Find the number of terms and the common difference. The first and the last term of an AP are 17 and 350 respectively. If the common difference is 9, how many terms are there and what is their sum? Find the sum of first 22 terms of an AP in which d = 7 and 22nd term is 149. Find the sum of first 51 terms of an AP whose second and third terms are 14 and 18 respectively. If the sum of first 7 terms of an AP is 49 and that of 17 terms is 289, find the sum of first n terms. If the sum of the first n terms of an AP is 4n - n2, what is the first term (that is S1)? What is the sum of first two terms? What is the second term? Similarly find the 3rd, the10th and the nth terms. Find the sum of first 40 positive integers divisible by 6. Find the sum of first 15 multiples of 8. Find the sum of the odd numbers between 0 and 50. A contract on construction job specifies a penalty for delay of completion beyond a certain date as follows: Rs. 200 for the first day, Rs. 250 for the second day, Rs. 300 for the third day, etc., the penalty for each succeeding day being Rs. 50 more than for the preceding day. How much money the contractor has to pay as penalty, if he has delayed the work by 30 days. A sum of Rs 700 is to be used to give seven cash prizes to students of a school for their overall academic performance. If each prize is Rs 20 less than its preceding prize, find the value of each of the prizes. In a school, students thought of planting trees in and around the school to reduce air pollution. It was decided that the number of trees, that each section of each class will plant, will be the same as the class, in which they are studying, e.g., a section of class I will plant 1 tree, a section of class II will plant 2 trees and so on till class XII. There are three sections of each class. How many trees will be planted by the students? 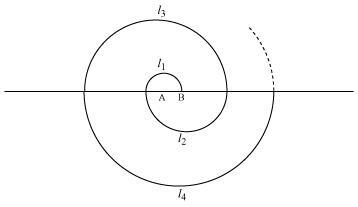 A spiral is made up of successive semicircles, with centres alternately at A and B, starting with centre at A of radii 0.5, 1.0 cm, 1.5 cm, 2.0 cm, ……… as shown in figure. What is the total length of such a spiral made up of thirteen consecutive semicircles? 200 logs are stacked in the following manner: 20 logs in the bottom row, 19 in the next row, 18 in the row next to it and so on. In how many rows are the 200 logs placed and how many logs are in the top row? In a potato race, a bucket is placed at the starting point, which is 5 m from the first potato and other potatoes are placed 3 m apart in a straight line. There are ten potatoes in the line. Which term of the A.P. 121, 117, 113 … is its first negative term? The sum of the third and the seventh terms of an A.P is 6 and their product is 8. Find the sum of first sixteen terms of the A.P. 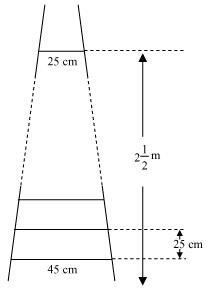 A ladder has rungs 25 cm apart. (See figure). The rungs decrease uniformly in length from 45 cm at the bottom to 25 cm at the top. 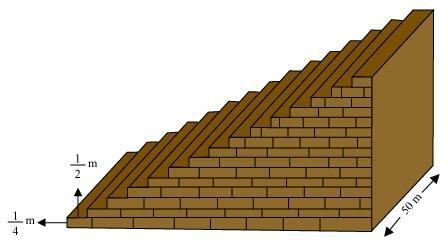 If the top and bottom rungs are m apart, what is the length of the wood required for the rungs? The houses of a row are number consecutively from 1 to 49. Show that there is a value of x such that the sum of numbers of the houses preceding the house numbered x is equal to the sum of the number of houses following it. Find this value of x. A small terrace at a football ground comprises of 15 steps each of which is 50 m long and built of solid concrete. Each step has a rise of m and a tread of m (See figure) calculate the total volume of concrete required to build the terrace. Maths : CBSE NCERT Exercise Solutions for Class 10th for Arithmetic Progressions ( Exercise 5.1, 5.2, 5.3, 5.4 ) will be available online in PDF book form soon. The solutions are absolutely Free. Soon you will be able to download the solutions.